Chicago, Chicago, It’s My Kind of Town! I just got back from a weekend trip to Chicago… where Barry Goss and I attended the System Seminar. Apparently Barry has been wanting to attend it for years… but it was actually the first I had heard of it. Coincidentally, Brad Callen wanted me to interview Ken McCarthy for him — the founder of System Seminar — so it was one of those small world “coincidental” stories (except that there’s no such thing as coincidences). Anyhow, I was able to work a deal with Ken for tickets in exchange for some work — and Barry paid for the hotel and airfare as an exchange for his ticket, so it didn’t cost me anything but some time. The seminar itself didn’t deliver the type of advanced info I was hoping for — there’s a choice of sessions to take, and the ones I chose all seemed kind of basic for me. But I did get a chance to meet Perry Marshall, Tim Knox, Sherman Hu and Gary Ambrose face-to-face for the first time, after interviewing both of them on the phone. 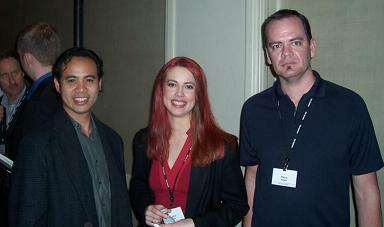 I also met Charles Amith, who had been an affiliate for ClickBank Affiliate Confessions (that’s him on the left in the picture), as well as Ari Galper and John Carlton, among others. But probably the most fun was connecting with Barry, face to face for the first time. We’ve been working together off and on for almost a year, in one way or another. Before Masters of the Secret it was little things here and there; but we were also good friends that whole time. I remember many hours spent on my cell phone during “drive time” (time coming back from stores when I was working for Nokia) talking to Barry about life in general. So it was really exciting to meet each other in person. From the moment we first saw each other in the airport, it was clear we had a deeper connection as friends than most. The past few weeks were starting to look a little dicey. Barry and I have been arguing a lot, about the project mainly, but also about the fact that I think he had some preconceived notions about me that weren’t true. Now that we’ve spent time together, and he’s seen the real me — rather than just talking over the phone — I think he understands me better. We went to a jazz club for dinner and then to the local Second City for some comedy, and being able to loosen up around each other proved that I’m not out to compete with him, I just want to work with him as a team. And as he mentioned… at times we have a kind of brother-sister energy going on. Strangely enough my brother and Barry are both Leos, and my brother and I fight too (or rather, we haven’t talked much in the past several years because he and his wife decided they didn’t want to). In this life, it’s hard to find people you love working with, who also turn out to be good friends that you enjoy playing with. This time, without reservation and looking forward to another huge success, we’re both dedicated to making it work.